The musical tale of a dashing hero, his trusty squire, and a fair princess who set out to save the kingdom of Valencia from an evil king, Galavant is a natural fit for ABC’s family-friendly Sunday nights, taking over for Once Upon A Time during its winter hiatus. The series opens with said hero, Galavant (Joshua Sasse), racing to save his beloved Madalena (Mallory Jansen) from the clutches of King Richard (Timothy Omundson), who has kidnapped Madalena and intends to marry her. It’s a classic fairy-tale setup, and everything looks to be on track as Galavant saunters into the wedding, prepared to duel for his love. The fairy-tale ending doesn’t come, however, and when the good knight spirals into a prolonged depression, it takes Princess Isabella (Karen David) and a plea for help to get Galavant back in the saddle. Galavant may be something entirely new for ABC (and the only half-hour network musical series in recent memory), but for fantasy or musical theater fans, it’s the latest entry in a long and hallowed tradition. Part loving tribute to fairy-tale heroics, part self-aware parody, the series has clear ties to cinematic favorites The Princess Bride and Shrek and Broadway hits Into The Woods and Spamalot. 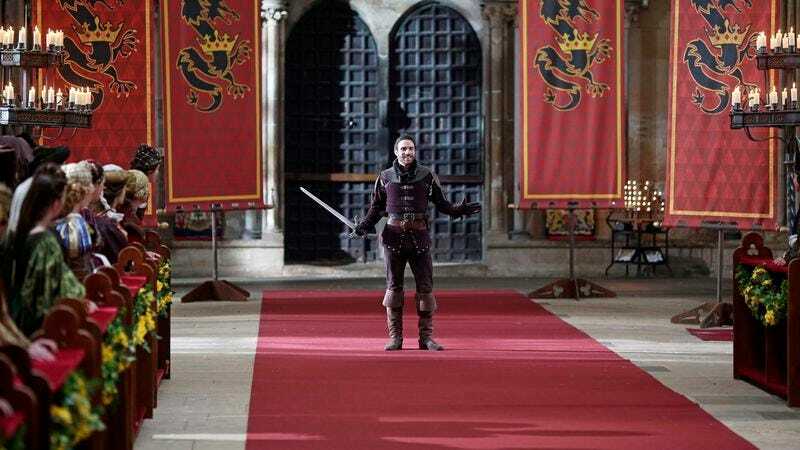 Though it is not without charms, Galavant falls far short of these predecessors, lacking the emotional heft of the more dramatic entries and the memorable moments of the comedic ones. The strongest episode is the pilot, which efficiently introduces the characters and sets up the world, and features the catchy and delightful theme, written—along with the rest of the music—by composer Alan Menken (of The Little Mermaid and Beauty And The Beast fame) and lyricist Glenn Slater (best known to Disney fans for Tangled). Each episode features two songs—but unfortunately, few rise to the level of the theme. Musicals allow for moments of transcendence and transformation as characters discover truths about themselves and their world, finally experiencing emotions bottled so tightly that they can only escape by bursting out of their shells. Galavant’s most successful numbers are those underpinned with emotion, be it desperation, weariness, or love. Unfortunately, several are perfunctory, included not because the larger story or specific emotion of a scene demands it, but because it’s been a while since someone sang; this makes for a less intense experience, and a less striking one as well. The pilot establishes clear stakes and a sense of urgency, but the pace slows as the series continues, adopting an episodic approach to Galavant’s quest that sees the heroes pause along their journey to get into and out of scrapes. Sasse, David, and Luke Youngblood (as Galavant’s squire Sid) make for pleasant travel companions, however, and the trio has an easy rapport well suited to the show’s breezy tone. The highlight of the cast is Omundson, who counterpoints King Richard’s extreme ridiculousness in the early episodes with enough gravitas to make the character a believable threat. As Richard’s bodyguard and best friend, Gareth, Vinnie Jones is a lot of fun, and despite an utterly nonsensical relationship with the king, Darren Evans’ chef is a hoot. The entire cast is energetic and very game, throwing themselves into this potentially very silly series with infectious enthusiasm. Guest stars like John Stamos, Ricky Gervais, and “Weird Al” Yankovic are entertaining and similarly engaged, but their appearances are, on the whole, underwhelming. The guests are tasked with playing types that are far from nuanced, and frequently, the one note each is asked to deliver starts to wear thin before the end of their episode. This need not be the case however, as demonstrated by Hugh Bonneville’s Peter The Pillager. The most well integrated of the guest characters, Bonneville is surprisingly weighty in the role, and the paralleling of Peter’s and Galavant’s arcs adds needed depth to a particularly preposterous interaction. Despite its colorful guest characters and the evenly split time between heroes and villains, the series is disappointingly risk averse, content with being a bubbly diversion rather than a particularly varied take on an already familiar genre. Galavant’s focus on lighthearted quips and banter over character growth or introspection keeps it from packing the punch of its more emotionally driven precursors, but its sincere embrace of musical-theater tropes and unabashed silliness are likely to win the show a loyal fan base nonetheless.